Prisoners is as much a compelling drama as it is an investigation into the psyche of moral dilemma and how far is too far when the end goal is hope, but the road is littered with hate. It presents an interesting debate for the audience to discuss not only because it documents a gripping series of events, but because it begs you to ask yourself what you might do were you placed under the circumstances of the characters on display here. The film opens with a stark shot of a wooded area. The gray and light tints of green and brown are almost overwhelming, but we are soothed by the voice over of a man praying. He is saying the "Our Father," and though my first thought was somewhat dismissive of this being a cheap trick to try and be mysterious and vague by serving up the familiar words as a cautionary layout for where we were headed there came to be no religious theme, but simply a characteristic that helped us better view the complexities and the eventual battered state of Hugh Jackman's body and soul. Director Denis Villeneuve (Incendies) makes his big studio debut with this film and he has picked and intricate and tightly plotted script from Aaron Guzikowski (Contraband, I know, I know) and filled it with such massive talent that what at first seems to be little more than a story about two girls being kidnapped with their respective families doing whatever it takes to try and find them and turns it into something akin to the great crime dramas that have come out over the past two decades, mostly thanks to David Fincher. 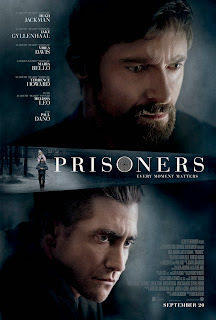 I mention Fincher specifically as Prisoners shares more than a tone with both Se7en and more appropriately Zodiac as it featured a subdued but impressive performance from Jake Gyllenhaal and this film gives us an equally subtle, but more intense showing from the actor. The film is a mystery wrapped in the normality's of middle America which allows it that extra layer that makes it all the more chilling, all the more close to home, yet doesn't flinch or back away from what it's committed itself to when it gets down to the tough spots. 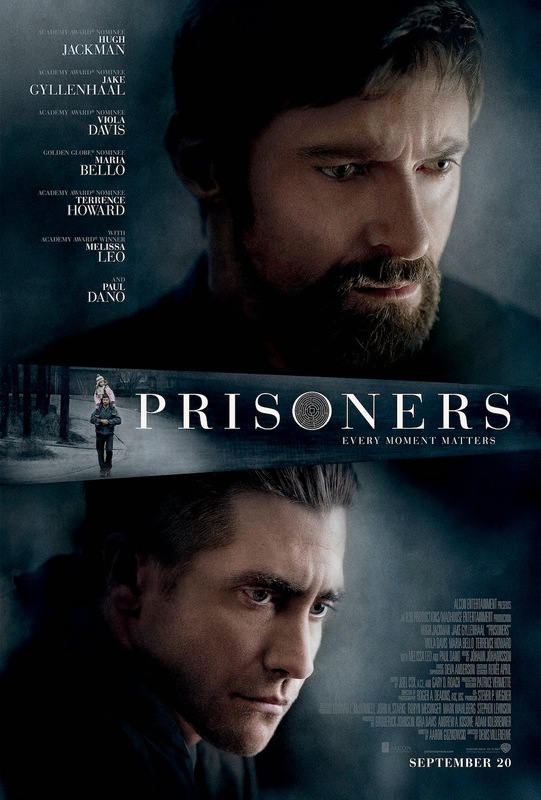 Prisoners is a brutally relentless, but consistently engaging film that stays with you. 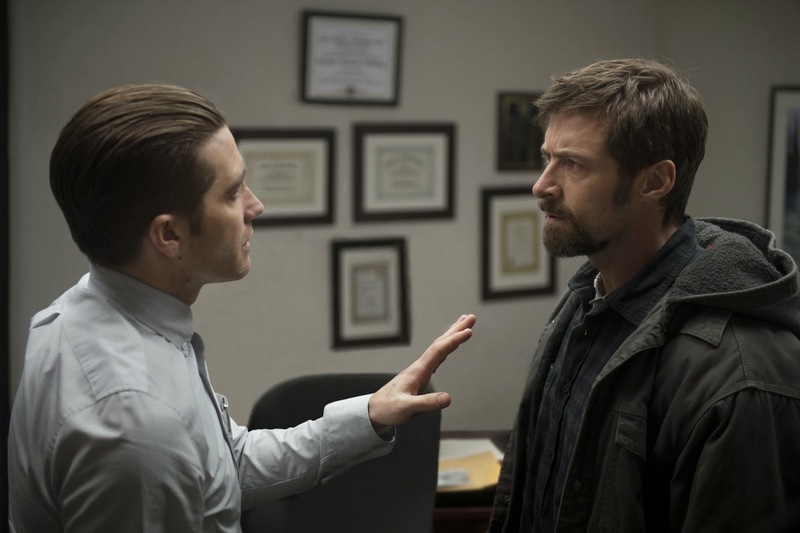 Detective Loki (Jake Gyllenhaal) and Keller Dover (Hugh Jackman) discuss the case of Keller's missing daughter. Upon first seeing the trailer for this film I was afraid it was yet another victim of those studio projects where they decided to show too much in the trailer and not trust in the star power they'd recruited or the project itself to advertise it without absolutely letting people know this was something they'd definitely be interested in. Those fears were put to rest when what happens in the trailer all takes place fairly early in the film and I knew we were in for a two and a half hour picture. To say more than this would be to give away more than the advertisements do, so I digress. What makes Prisoners so effective though is essentially these opening moments because without them and without the craft that is applied to them we wouldn't care nearly as much for these people no matter how sad their situation or desperate their plight. We are introduced to the Dover family made up of Keller (Jackman), his wife Grace (Maria Bello) and their two children Ralph (Dylan Minnette) and Anna (Erin Gerasimovich) as they prepare for Thanksgiving at their friend and neighbors house, the Birch's. Where the Dover's are pure middle class, scraping by from paycheck to paycheck the Birch's are veterinarians and just a tad more upscale. Patriarch Franklin (Terrence Howard) and his wife Nancy (Viola Davis) are more than humbled to share their home with what naturally come off as close friends during the holidays and their kids are close in age and get along to boot, so why not? It is when Anna and the Birch's youngest of two daughters, Joy (Kyla Drew Simmons), disappear without anyone seeing where they went that things begin to get tense. Before that there is a relaxed, comforting vibe that is re-enforced by the chosen wardrobe for each, the football game on TV, and the abundance of pies on the kitchen table. 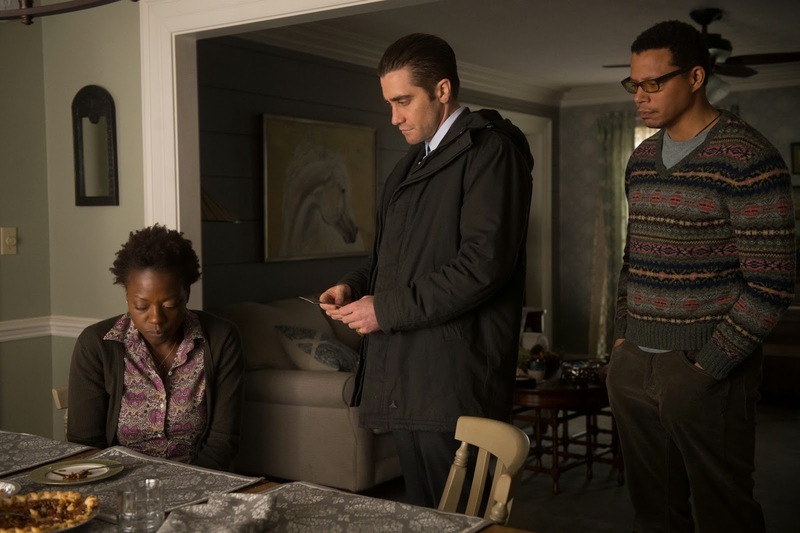 After the families search the neighborhood without little more than a clue the police are brought in and represented largely by Detective Loki (Gyllenhaal), a man with a bit of a vague history himself, but a proven investigator and a passion for solving crimes. The trailers indicate a seemingly spoilery character in that of Paul Dano's suspicious Alex Jones and his RV that was parked in the neighborhood where the Dover's and Birch's live when the girls went missing, but the intricacy of the plot will leave you questioning his vitality until the last moment. There was always this inherent feeling that the film may not add up to be more than a melodramatic piece that took a horrible incident, such as child abduction, and surrounded it with crying parents while ultimately adding up to nothing more than a police procedural. I'm sure it would have been very easy to go down that road, but thankfully for us Villeneuve has crafted a more layered film that is just as much about how well the story is told as it is about who these characters are and how far they will allow themselves to be pushed. There is a darkness to the film, it is always drenched in the same color palette, always raining or covered in ice and snow. The chilling weather is meant to reiterate the chilling realities of the situation at hand and it is shot beautifully. The king of cinematographers, Roger Deakins, worked on this film and his photography elevates the material on its own. There is no shot, no line of dialogue it seems that is without intent, not meant to elicit some type of meaning or give the audience some kind of indication as to what the bigger picture is. That is as much a testament to Deakins as it is Villeneuve for as much as the director influences the set-up and frames what he wants the audience to see it is the way in which these images are captured that speaks unnoticed volumes to the audience and gives them a sense of atmosphere and of things that word encompasses you can't capture on film. The smells, the textures, all of these elements come together as we feel the invading anxiety of Jackman's character closing in on him not only because of the great performance he is giving but because we fundamentally understand the world he is existing in and that it's not just his current circumstances, but the whole tone of this space around him that forces him to go places he may have otherwise not thought himself possible. And while the look and performances of the film are clearly top notch, what really struck a chord with me was the way the film was put together. It is briskly paced, but operates in long shots and few cuts. Not often are we given several different angles of a character or scenario, but simply left with an impressionistic framing of a scene that was wholly more effective and powerful than had it been over-complicated with fancy camera work displaying a distrust with the performers. One can only do so much with technical aspects and the written page though. To bring the words to life effectively, no matter how frightening, is to have people with the ability to transcend the stock reactions we'd expect parents to have to their child going missing and dig deeper into what makes them tick in light of such a tragic event, what is their process, how would they deal with it? While the focus is clearly on Jackman's character each of the supporting character contribute a different idea of what there is to resort to. Whether it be Howard's trepidation towards Keller who thinks before he acts and thinks it through or Maria Bello's lost mother who is so lost she seemingly doesn't know what to do so she does nothing at all. One of my only qualms with the film being that Davis is criminally underused, getting barely a handful of scenes where her commanding presence is used to conduct the actions of those around her. She is a strong woman, as determined and level-headed as her husband, but with a longer string of nerve. Both Dano and a barely recognizable Melissa Leo give chillingly and subtle performances that are not to be overlooked, but this is really Jackman's show all the way. We can see not only in how the bags under his eyes grow deeper and more red with each passing day, but in his voice, in his slowly degrading posture that it may only be a matter of days before he has no energy left to exert. He is a force to be reckoned with and his Keller is the type of man who takes things to heart and acts on them rather than letting them ruminate. He is a worker, he is prepared, he is accustomed to doing things for himself and making things happen thus the reason it is so difficult for him to sit back and watch as Loki asks him to do that exact thing repeatedly. While Jackman will get the well deserved praise for his emotionally taxing a morally complex portrayal it is Gyllenhaal who stands out as a mysterious man in his own right. We learn no background about his detective and we don't really get to know him on a personal level throughout the film, but it is the small hints, the precise details such as the ring he wears or the fact he is sitting alone at a restaurant when we first meet him, on Thanksgiving night. They all add up to an unclear picture of a human being who seems to constantly be looking for some kind of redemption, some kind of worthy penance to make up for his unknown past. It is as layered a performance as the film is and it represents the best aspects of a movie that makes us question ourselves and if our suffering would be enough to justify that of others.